Able Electric provides a service that is second to none in electrical maintenance so when your fuse box needs repair or replacement we are your number one choice. When dealing with electrical equipment it often presents dangers and can even cause fatalities so it is always best left to professionals. 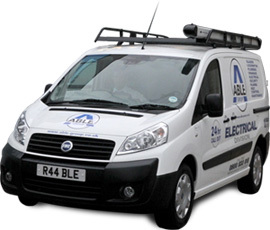 We have fully qualified electricians who can be with you within 30-90 minutes wherever you are in the UK. Our professional and trained operators are available 24/7 and can give quotes or estimates on all fuse box services. Simply ring our free phone services or contact us by our quick reply form.